These Carrot Cake Muffins with cream cheese frosting are very easy to make and taste and smell delicious! Hello my friends! I’m sharing with you today one of my favorite recipes. These Carrot Cake Muffins are inspired by our delicious Carrot Bread Recipe. I wanted to come up with a quick and easy recipe that you and I could put together in little time without jeopardizing taste. 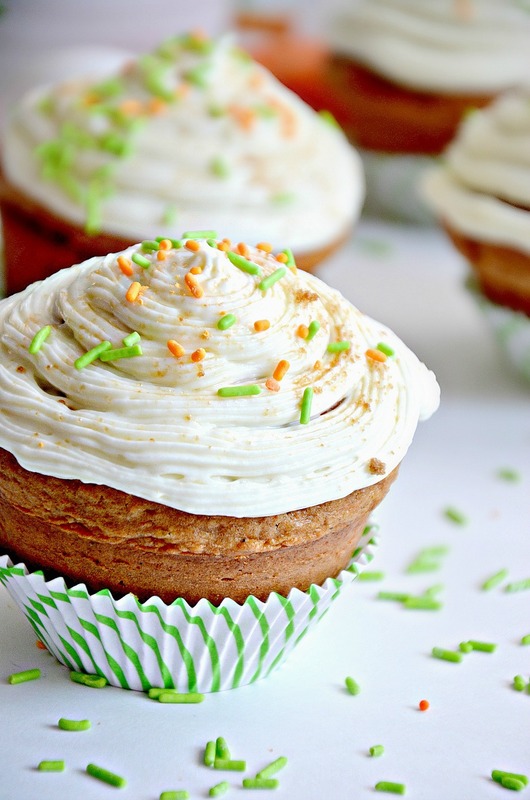 These carrot muffins have a great aroma and they are super moist and soft inside. I love making them for Easter and also during the Fall. 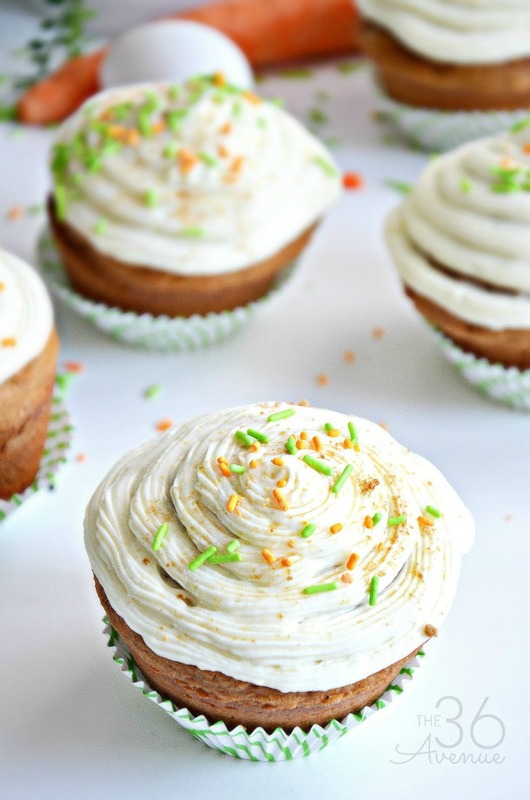 The cream cheese frosting is creamy and light, making these carrot cake muffins seriously the best! Wash carrots under cold water and peel using a vegetable peeler. Use the grater to thinly grate them. In a medium size bowl mix cake mix, eggs, and oil. Add shredded carrots and mix for another minute. Pour mixture into a muffin pan and bake for 25 minutes. Move the muffins to a wire cooling rack. For the frosting microwave milk and chocolate in a small bowl for about 30 seconds; stir until the chocolate is completely melted. Combine softened cream cheese and white chocolate mixture in a mixing bowl. Use electric mixer to mix until creamy. Add the whipped topping and mix some more. Add powdered sugar and mix well again until all the ingredients become one. Transfer frosting to a pastry bag. Frost the muffin starting from the outside and go in circles making your way to the top. Sprinkle with brown sugar and sprinkles. Store them in an air tight container and refrigerate. Here are other yummy recipes that we love! This is a very easy cake recipe using fresh limes, yogurt, and a bunch of other yummy ingredients. This bundt cake is simply delicious and for sure a family favorite. It is so pretty and it tastes amazing. I can’t wait for you to try it! 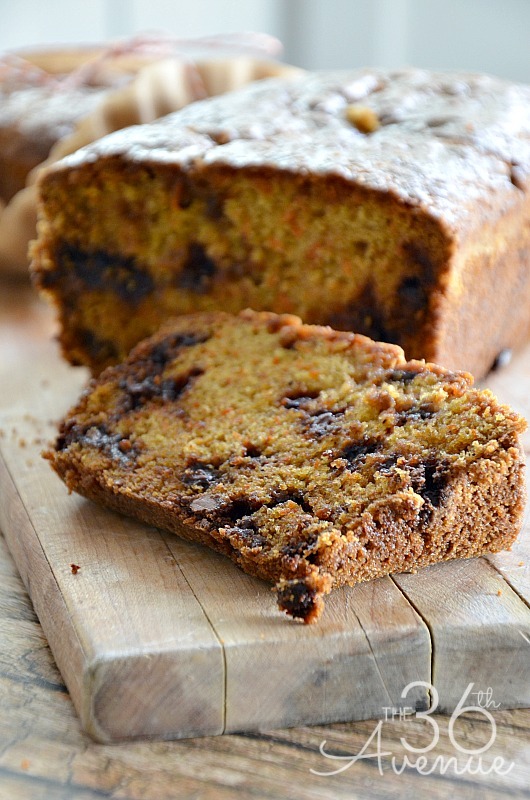 With Spring here and Easter just around the corner I thought to share with you one of our favorite recipes for this time of the year, our Carrot Bread with chocolate chips and Brown Sugar Almond Glaze. This bread recipe is delicious and for sure a family favorite. 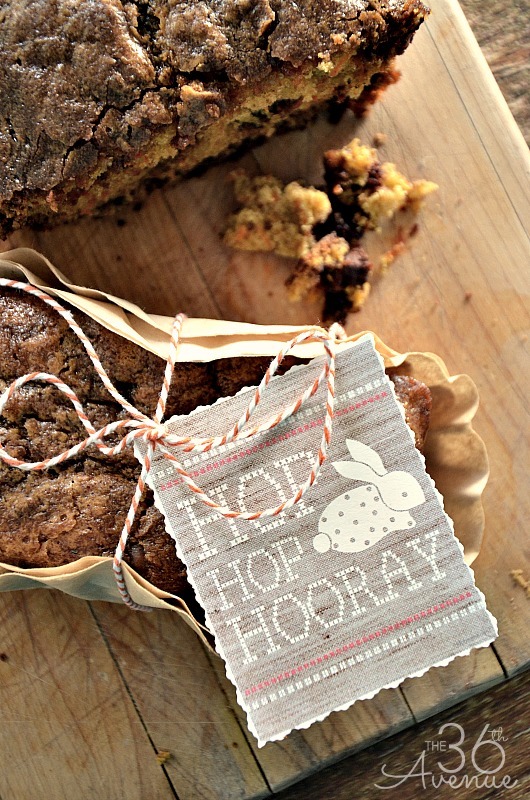 Easter is almost here and it’s time to start thinking about Easter Recipes. Do you have a favorite one? Is there a family recipe you cook for Easter dinner? I’m always looking for new ways to celebrate special holidays like this one. If there is anything you do that you would like to share make sure to leave me a comment… I would love to hear it! These are beautiful and look absolutely delicious! My husband loves carrot cake and I know he will definitely appreciate them! They are so easy to make.. My family love them!